Wouldn’t you like to start the new year with a restored sense of confidence? Now you can with professional teeth whitening in the Lehigh Valley. If you are like one-third of adults, you probably feel insecure about the appearance of your smile. This is often due to dark tooth discoloration. While you may have tired over-the-counter whitening treatments in the past, you were probably left feeling disappointed with the results. To lift away stubborn stains that cannot be removed at home, your cosmetic dentist has the solution you need. You cannot avoid tooth discoloration because it is a natural part of the aging process. When this is combined with poor oral hygiene, darkly pigmented foods and drinks, or smoking, your teeth can turn yellow or brown. As they lose their bright white appearance, your confidence is often lost along with it. Not only do you feel insecure about your smile, but it can also make you appear several years older than your true age. To turn back the hands of time, you need a professional whitening treatment from your dentist. Unlike over-the-counter systems, you will achieve noticeable results that last. In fact, the National Institute of Teeth Whitening reports that 82% of Americans saw noticeable results after a professional treatment. With the start of the new year, what better time than now to invest in your confidence with a professional whitening treatment? 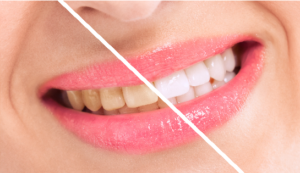 Unlike over-the-counter whitening systems, those that are available from your dentist contain highly-concentrated whitening agents to deeply penetrate the enamel to get your teeth as much as 10 shades whiter. Now, you can get the drastic results you want from the comfort of your own home with a take-home kit. After performing an initial consultation, your dentist will provide you with custom-fit whitening trays. This not only ensures your comfort, but helps to promote the even and consistent distribution of the whitening agent. In addition to the trays, you are given the professional-grade whitening agent to use at home and around your own schedule. By following your dentist’s instructions, you will see your teeth become up to 10 shades whiter over the next 10 to 14 days. After you have finished the treatment, your new smile will last with the right aftercare. To maintain your new smile, it is best to practice proper oral hygiene and visit your dentist regularly. In addition, limit your contact with stain-causing factors, like coffee, tea, and smoking. It is best to brush your teeth or rinse your mouth with water immediately afterward. This year, give yourself the gift of confidence with a professional whitening treatment from your dentist. Dr. S. John Salivonchik is a well-respected and trusted dentist in the Lehigh Valley. In addition to general dentistry, he provides an array of cosmetic services to create healthy, beautiful smiles. If you are ready to reverse tooth discoloration, contact our office today to schedule a consultation.